Hi! I’m Emily Matchar. I write about culture, women’s issues, food, travel and more for publications like The Atlantic, The Washington Post, Salon, Gourmet, The Hairpin, Babble, Men’s Journal, BBC History, Outside, Lonely Planet and lots of others. Before I started full-time freelancing, I worked as a newspaper reporter, an editorial assistant at a national magazine, and a professional blogger. Before that, there was a stint as an ambulance driver (less exciting than it might sound) and a rather depressing period of waitressing in a Japanese restaurant (nobody looks good in a blue polyester kimono). I have a degree in English from Harvard University, and I live in Hong Kong and Chapel Hill, North Carolina with my husband, Jamin Asay. I’m currently hard at work on a book, a critical look at the New Domesticity phenomenon, due out from Simon & Schuster in May 2013. 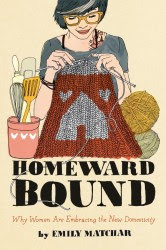 As someone with a longstanding – albeit often ambivalent – interest in the domestic arts, it’s been fascinating talking to knitters, jam-canners, homeschool moms and radical homesteaders about why so many 21st century women are returning to the kind of old-fashioned domestic skills their mothers and grandmothers happily left behind. I want to understand what this means for women, feminism and society, and everyone seems to have their own opinion – often a very strong opinion! If you’d like to share your own view on New Domesticity (please do! ), or if you have any questions or comments, please email me at ematchar [at] gmail [dot] com.